Note: Camas Valley is a partner school with Douglas County Partners for Student Success (DCPSS) working to expand Career Connected Learning (CCL) experiences for all students across Douglas County. The goal is to establish a system where career experience opportunities are available before graduating high school so that students can develop purposeful plans for their future. 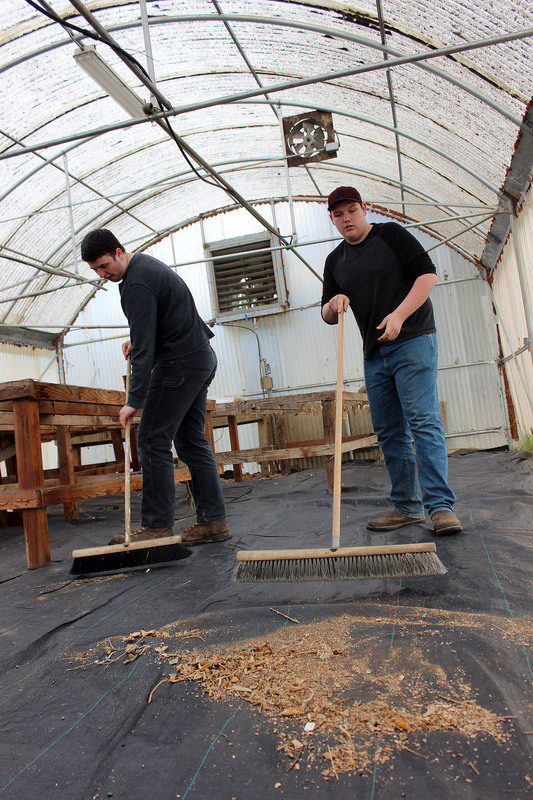 Brandon Powell and Chane “Pete” Johnsen sweep up debris in the greenhouse at Camas Valley Charter School. The air filled with dust and the scent of old soil as students swept debris from Camas Valley Charter School’s greenhouse recently. What was once an outbuilding overgrown with blackberry vines was transforming into a workable space with endless potential. “To watch it change, from looking like a jungle to looking clean … it’s fun,” said Camas Valley sophomore Brandon Powell, 17. 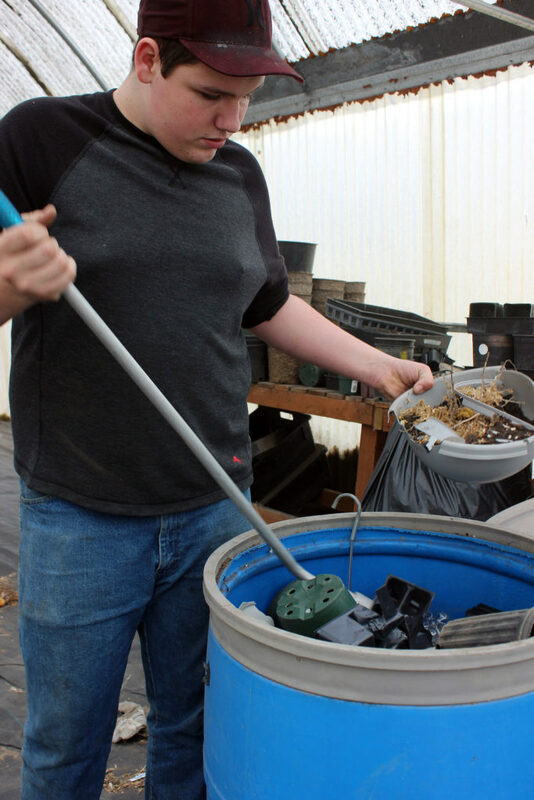 Powell and other participants in the school district’s Youth Transition Program have been working on the greenhouse throughout the school year. On this day, they spent about 30 minutes removing dirt, sifting through plant containers and throwing out trash. As they worked, they cracked jokes and chatted with YTP Specialist Robert Brown. The greenhouse project is one of many the YTP participants have undertaken since the beginning of the school year. The program is meant to prepare students with disabilities and other barriers to employment for life after graduation, including employment, or career-related post-secondary education or training. Appropriate work attire and language, work ethic and responsibility are just a few of the skills students said they’ve picked up over the year. “It makes me feel more confident about working,” said Nathan Powell, a 17-year-old junior. Last year, Camas Valley School District received a two-year grant for the program, which is a collaborative partnership between Oregon Department of Human Services Vocational Rehabilitation, Oregon Department of Education and the University of Oregon. Camas Valley Charter School Vice Principal Tyler Ochs said the push to implement YTP this school year came from district special education teacher Bill Storey, who believed that many of the students weren’t learning the so-called soft skills necessary to enter the workforce. “Having a program to focus on work ethic, financial management, time management and customer service was needed for many of our students,” Ochs said. The district hired Brown, who also teaches Spanish, to serve as YTP specialist. 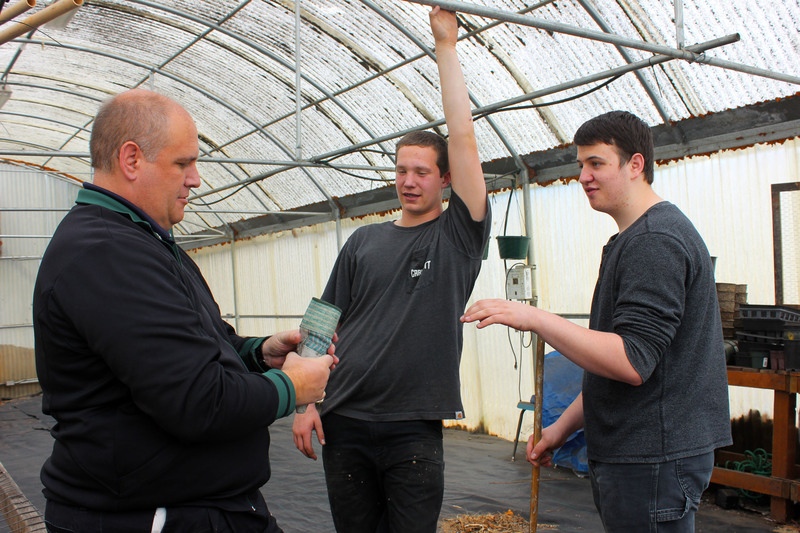 Youth Transition Program Specialist Robert Brown, from left, and students Nathan and Brandon Powell, discuss work in the greenhouse at Camas Valley Charter School. Ochs said part of Brown’s time is spent collaborating with local businesses, government agencies and nonprofit organizations to provide services to the students. Nathan and Brandon Powell, who are cousins, said they both enjoy working with their hands and believe that their new skills will help carry them into the workforce. Throughout the year, the students have pitched in around the school cleaning buses, sweeping leaves and helping in the cafeteria, among other tasks. They’ll soon be opening a store in Brown’s office where they plan to sell healthy snacks and beverages, along with school supplies and memorabilia. The students also plan to start growing plants in the greenhouse to sell. Other students throughout the school have been able to join the YTP students in their projects over the year, Brown said, pitching in on the green house or bus cleaning, for example. Chane “Pete” Johnsen, 15, a sophomore, is considering construction, electrical work and welding as career options. Other participants are interested in logging, beauty school and the arts. “I have several career paths that I hopefully go into,” Johnsen said. Chane “Pete” Johnsen works in the greenhouse at Camas Valley Charter School. A requirement of the program is to connect 10 students with Vocational Rehabilitation over the two-year grant period. That will ensure that students have continued support after they enter the workforce, such as ongoing training and financial assistance. Brown works with a VR counselor to identify students’ needs and help develop a plan for success. Brown hopes to continue receiving funding for the program, which he said helps fill the need for career-connected learning opportunities in Oregon. He said he’s enjoyed watching the students bloom throughout the year. This is fantastic! I have been working diligently to also get life skills into the Douglas County schools over the past three years. I am not sure why I have not connected with Camas Valley. The program I have been working with is Botvin Life Skills, an evidenced based curriculum that starts as early as fourth grade and has many levels up through twelfth grade. If you would like more information please contact me at 541-295-5075.